In recent months, the UK has launched two ambitious strategies to lead the world in cutting carbon emissions to combat climate change, while driving economic growth. Both strategies emphasise and confirm at the highest level the UK’s commitment to the principles underpinning the purpose and aims of Mission Innovation. Read about the UK approach to achieving clean growth and the funding committed to support clean energy innovation. The Industrial Strategy: building a Britain fit for the future commits the UK to raising public and private investment in R&D to 2.4 per cent of GDP by 2027, the UK’s largest increase in public spending on science, research and innovation in over three decades. The Industrial Strategy sets out Grand Challenges to put the UK at the forefront of the industries of the future, ensuring that the UK takes advantage of major global changes, improving people’s lives and the country’s productivity. Clean Growth is one of the four Grand Challenges announced at the launch of the Industrial Strategy. 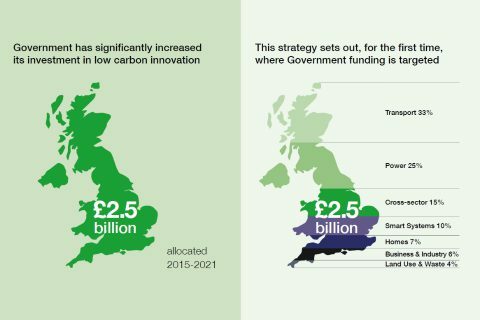 The UK’s commitments to Mission Innovation, both through increasing its clean energy innovation investments and working collaboratively internationally, are explicitly mentioned within both Strategies as a means to deliver the goals. The UK’s commitment to international partnerships is shown though a range of recent activities with MI member countries. On 18th April the UK’s Science Minister announced, as part of Indian Prime Minister Modi’s visit to the UK, that the UK will continue to grow its already strong research partnership with India with technology investments that focus on issues of global importance including clean energy. It is expected that funding to the UK/India research partnership will reach £400 million by 2021. The current UK/South Korea Smart Energy Innovation Collaboration competition (£3 million budget) is an opportunity for UK organisations to apply for funding to develop innovative smart energy solutions on a collaborative basis with organisations from the Republic of Korea. In March 2018, the UK and Saudi Arabia signed a memorandum of understanding on clean energy. The agreement commits both countries to work closely to develop new technologies to reduce carbon emissions and to share technical knowledge and expertise on clean energy, including smart grids, electric vehicles and CCUS. UK delegations have recently visited several MI member countries to explore opportunities to collaborate on clean energy innovation including offshore wind energy missions to the US and China and advanced materials to South Korea. The UK’s Global Business Accelerator Programme provides further opportunities for such missions in future. The UK’s commitment to Mission Innovation is also demonstrated by its participation in all Innovation Challenges, co-leadership of IC#7 and leadership of the Mission Innovation Secretariat. Please contact Sarah Webb for more information on these developments and on collaboration with the UK.